Lock in a great price for Motel One Bremen – rated 8.9 by recent guests! This is a large modern hotel in a good location. Our room was good sized, bright and very clean. Hotel has lifts. Parking is available below the hotel for a price. Breakfast (for 9.50) was very basic for a hotel of this size but plentiful. The location is very good, located right by the tram stop to/from the airport & also very close to the tram stop for going to my office. It's also very close to a lot of good restaurants, close to the Schlachte & the river. It's great that the bar is open & does not seem to close as is managed by the reception staff. Staff were helpful too. Great location, great price, nice balcony. In fact, I am at another Motel One in Berlin...they are great! Motel One Bremen This rating is a reflection of how the property compares to the industry standard when it comes to price, facilities and services available. It's based on a self-evaluation by the property. Use this rating to help choose your stay! 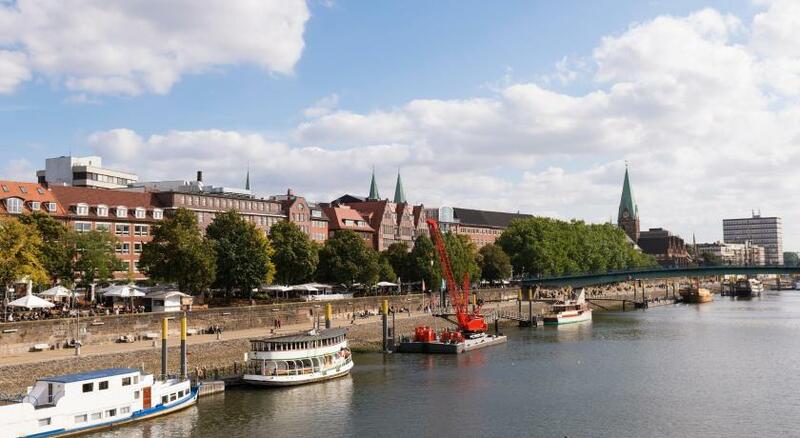 Centrally located in Bremen’s Old Town, this modern hotel is just under 1 miless from Messe Bremen convention center and 2 miles from Weser Stadium. It offers free Wi-Fi and a 24-hour front desk. Motel One Bremen features stylish non-smoking rooms decorated with contemporary furniture. Each is complete with air conditioning and flat-screen TV. The private bathroom includes complimentary toiletries, a rain shower and granite stone design elements. A buffet breakfast is served every morning in the hotel’s dining room. Guests will find numerous restaurants, cafes and shops within a 2-minute walk of Motel One Bremen. Nearby attractions include the historic town hall and St. Peter’s Cathedral. The Schlachte (medieval harbor) is a quarter mile away. Bremen Central Train Station is just under 1 mile from Motel One Bremen. Bremen Airport is also only 2 miles away. House Rules Motel One Bremen takes special requests – add in the next step!